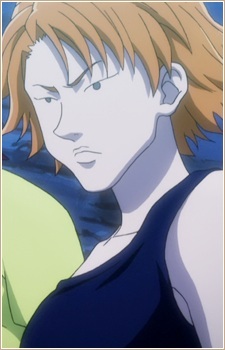 One of the people working in an alliance to stop Gensuru's team. She made the demands that only people with more than 50 cards were allowed in, and they had to be of use. When she questions the use of Bisuke, Gon and Killua, who she believes are merely kids, Killua in turn questions her use. He makes her pay with rare cards in exchange for information about Gensuru's abilities. They attempt to beat Razor and the pirates to get Tsubo of the Coast, but they fail. Later on, Gensuru says he killed her and the others, infuriating Gon.